Sits between dreadnought and jumbo norms, yet has strong midrange projection, too: unique. Exceptional value for money. Unique design and tones. Impressive build quality and components. Not a 'sweet strumming' dreadnought, if you're after that sort of thing. There are three body sizes in the Production Series from ; Cybele (the smallest, not on review), Eos (middle-size, reviewed elsewhere) and Freja (you guessed it, the largest - reviewed here). They all share White's contemporary styling, with unique outlines and relatively tight waists. When asked about their design, White explains he finds it hard to compare them to the well-known shapes, in fact his three designs overlap the spaces between the four dominant styles in the current market: Cybele straddles parlour and 000; Eos lies between 000 and dreadnought; and Freja between dreadnought and jumbo. While it's not the whole story, it helps to locate the start line. "Unusually at this price point, the main meat of the satin-finished neck and the headstock is one piece of wood"
White has worked with a new facility in Korea to bring his guitars to this attainable price point, and for £699 you'd have to say the specs impress. Our instrument has a scalloped X-braced solid Sitka spruce top over solid rosewood back and sides. With its honey-tinted gloss finish, you might wonder from afar if the top is cedar: it's definitely spruce. 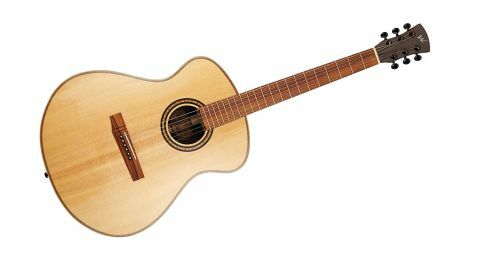 The aesthetic is all about modern, understated cool, though the lovely looking maple binding to the front and back of the body, wooden purfling and soundhole rosette make it far from an austerity instrument. For variety, White has chosen pau ferro (also known as morado or Bolivian rosewood, but it comes from Brazil, too) for the fingerboard and the slightly asymmetrical pinned bridge. Because true mahogany is in such high demand/limited supply, he's gone with Spanish cedar for the dovetail jointed neck - Martin uses it along with mahogany on many guitars, and has been doing so for many years. Unusually at this price point, the main meat of the satin-finished neck and the headstock is one piece of wood with a tidy and simple volute adding mass and strength at the weakest point. The heel is blocked, using just one extra piece of wood and while it's almost imperceptible until you look closely under good light, the fingerboard is also bound with pau ferro. While it doesn't display the kind of ultra-fastidious finishing of certain £2,000-plus brands, judged on its spec, build and finish alone in the context of the current market, this guitar could easily cost twice as much. The guitar's string spacing measures 35.3mm over a 43.2mm nut. These things are about personal preference, but that spacing, particularly, will feel tight for those who like to play fingerstyle. "£699 is exceptional value for a solid rosewood and spruce guitar, not to mention the high-quality construction and contemporary design"
Likewise, 55.5mm isn't expansive at the saddle, but it's no different from many modern guitars. The benefit is comfortable first-position chording, made all the more inviting by the slim (around 21.4mm deep at the first fret), easy-playing satin-finished C-profile neck. It'd be even more so with some extra fingerboard-edge rolling - perhaps a bit much to expect at £699! In any case, if you're not a long-time/dedicated acoustic player, making the jump from your electric to this guitar won't be a struggle when it comes to the neck dimensions and profiles, or indeed the scale length: 648mm is the same as a Fender Stratocaster or Telecaster. More experienced acoustic players may well want more meat in the neck and wider string spacing: it's a matter of personal preference. The large-bodied Freja is suited to contemporary fingerstyle playing, if you can deal with the tight string spacing at the nut. It has nicely extended trebles with decent bass and, as a result, is less about midrange dominance, more about a wide projection. It's a satisfying strummer, yet has a distinctly different voice from the rosewood-body Martin dreadnought we have to hand. There's still plenty of vocal midrange and string separation there, however; just what you need to get middle-of-the-fingerboard notes projecting strongly, the trade-off being that kind of fall-into-it strumming sweetness of a classic rosewood-body dread or, even more so, jumbo. That's no criticism, as it's designed to be a different voice, remember. £699 is exceptional value for a solid rosewood and spruce guitar, not to mention the high-quality construction and contemporary design. The Freja's extended bass and treble will appeal to modern-minded all-rounders. Refreshingly different and worthy of investigation.